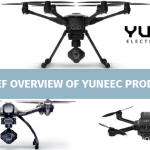 UAVs are gradually evading the market; furthermore, they become a must-have tool for filmmakers. It is really hard to imagine a videographer without a drone today. However, the market of drones continues growing and now, you can even find underwater flying machines. New submarine drones help perform numerous operations, making the exploration of the seabed much easier. But the question is – what are the best underwater drones? What things to consider before you buy a drone? In our expert review, we’ll try to cover this theme. Why Do Underwater Drones Become So Popular? Statistically, more than 90 % of the world’s oceans are still not studied. This is the main reason, why underwater drones attract National Ocean Service scientists. Thanks to this tool, they will be able to explore hidden ocean treasure, new species and lots of other aspects. Besides, underwater drones can be used in a variety of rescue operations and in such areas as marine biology, gas, offshore energy, recreation, military, aquaculture, shipping and much more. Thanks to an extensive set of features offered by underwater drones, operators can easily inspect ports, vessels, harbors, study the depth of oceans, lakes, etc. The price. The modern drone market is overloaded with options. Therefore, you should decide for yourself whether you need to use it for professional purposes, or just for fun. In the first case, it is better to buy a more expensive model whereas in the second case there’s no need to overpay. Autonomy. The choice is huge; some models can fly longer whereas others have a short flight time. Wire or wireless. Some underwater drones still need a wire; they aren’t autonomous. Keep in mind that the radio signals don’t work well under water so some of them can’t work without physical attachments. Wireless underwater drones are more expensive and provide its owners with a greater set of features. Check the cleanliness of the camera lens and sensor apertures. These are the key aspects to consider before you finally order your first underwater drone. Please, don’t make facile decisions because in this case, all pros and cons should be considered. Navatics Mito. 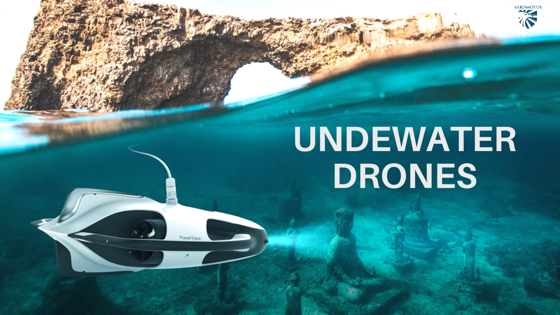 It is a stable 4k underwater drone with the speed 2m/s and max depth 40 m. The drone comes with a high-performance stabilizer and can easily adjust pitch angle to 45 degrees. This model is capable of making high-quality photos up to 12MP and shooting in 4k. You can pilot it using wireless remote control. Its average price is $1.500. Ibubble. 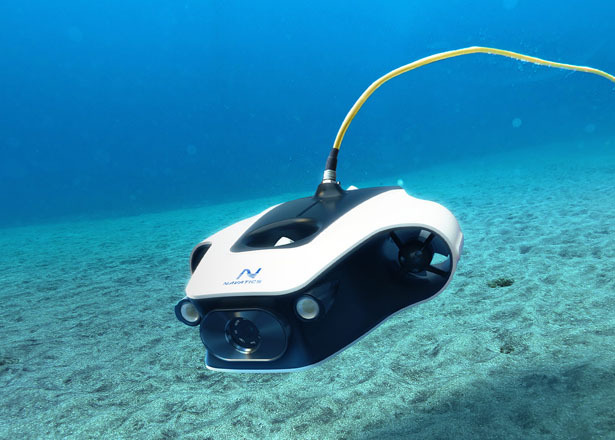 If you are a scuba diver, the use of this drone might be the best solution for you. Its speed is 1.5m/s and max depth is 60m. The biggest benefit of this particular model is that no wire is needed. Besides, it is fully autonomous; it can follow you during your immersion. Thanks to a high-quality 4K camera, you can make amazing images. However, it is not cheap – $4.000. Powerray. 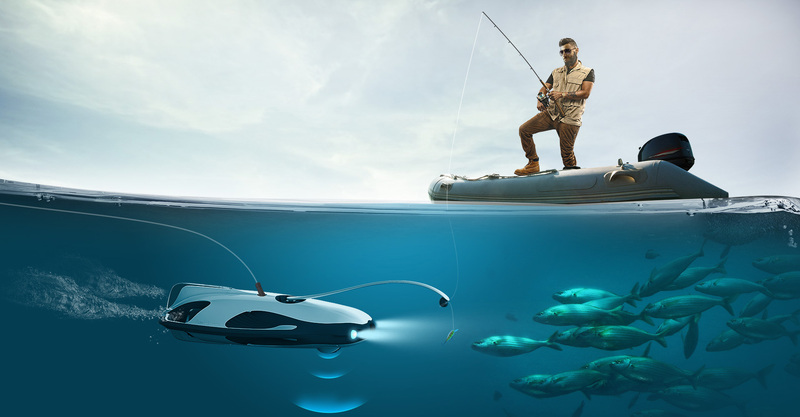 Developers promise that this UAV is a perfect solution for fishermen. Its speed is 2m/s and max depth is 30 m. The drone comes with sonar and sensors so its users will easily check the water temperature, the presence of fish, typology of the seabed, etc. You can make professional 4K videos. The price is $2.300. Blueeye. 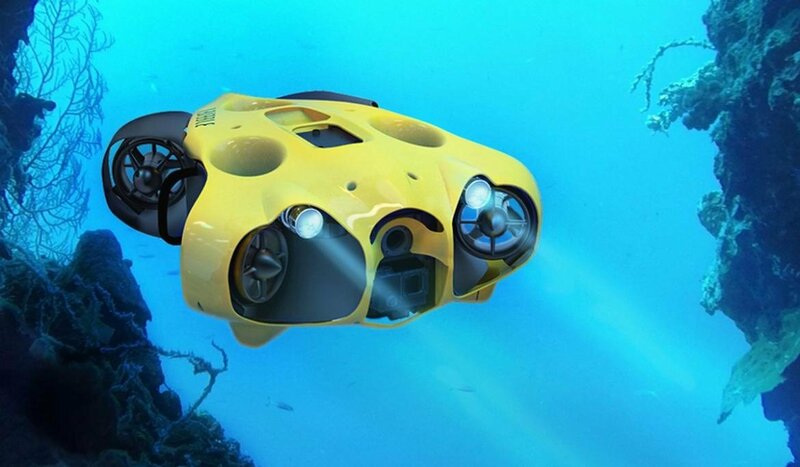 This drone is manufactured in Norway and can dive up to 140 meters deep. Thanks to WIFI connectivity, you can use it up for 2 hours. Its average speed is 2m/s. The biggest benefit of this model is that you can use you VR glasses and enjoy the underwater views staying on the shore. However, it is not cheap; if you want to enjoy its features, you’ll pay up to $6.000. We’ve just reviewed the best underwater drones that are offered for sale today. We see that drone technology continues expanding into the deep ocean. Thanks to these drones, lots of new areas can be explored and many catastrophes can be prevented.